Propane gas is an excellent and inexpensive energy source that can be used to heat your Zephyrhills Florida area home and power the heating elements in your stove and oven. There are many misconceptions, however, about what propane actually is and how safe it is to use. If you’re looking for a reliable and cheap source of energy, you should certainly find out more about this incredibly useful gas. Propane is derived from both crude oil and natural gas through a particular refinement process. This process produces a gas that can be liquefied by keeping it at a very low temperature. Liquid petroleum can only exist at temperatures below -44°F, meaning that it is extremely cold. Above this temperature, propane assumes a gaseous form, and it is in this form that you’re able to make use of it in your home. Contrary to popular wisdom, propane is actually a very safe, clean and efficient energy source. Propane tanks are extremely strong and will not explode under normal conditions, and you don’t need to worry about your tank leaking or malfunctioning. You only need to know what to watch for and when to call for a refill of your tank. Also, propane is quite inexpensive when compared to other sources of energy, particularly electricity. When your propane gas tank is installed, your representative will gladly answer any questions you may have about how to monitor your tank and use propane safely. The main things you should be aware of in terms of safety are the smell of propane and how to read the gauge on your tank to avoid running out. Propane gas on its own is odorless. However, in order to make it easy to detect the presence of this substance in the air, manufacturers add an odor to the gas. It’s important you know exactly what your propane gas smells like ahead of time so that you will recognize the odor should it manifest. The propane tank installers or your Bahr’s propane fuel delivery driver who refills it for you can let you smell your propane to develop a sense for what a leak would smell like. In fact, it’s a good idea to have everyone in your household become familiar with the smell. The most common reason that you might smell propane in your home is an empty tank. If this occurs, you should go and shut off your tank completely and call us for a check and refill. There are also some people who have trouble smelling propane gas due to a diminished sense of smell or insensitivity to certain odors. If you fall into this category, you may want to have a mechanism installed in your home that will detect the gas when present in the air. Call Bahr’s today if you need your propane tank refilled. 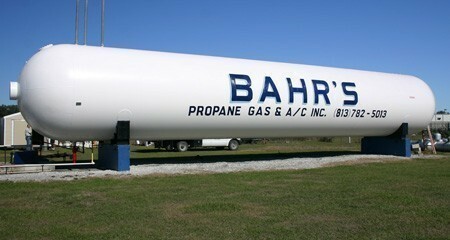 Here at Bahr’s, we provide a full range of propane services to our customers. Whether you’re looking to have a new propane tank installed or need an inspection and repairs performed on an older tank, our expert technicians will be on hand to assist you. We also provide propane delivery and all scheduled or required maintenance, so you can rest assured that your propane tank is functioning exactly as it was meant at all times. And if you’re not sure exactly what you may need, our expert staff and technicians are always happy to provide advice and information to help you make the best decision for your home and family.